Geez Louise! The 4th of July is less than a week away!? Where did June go? 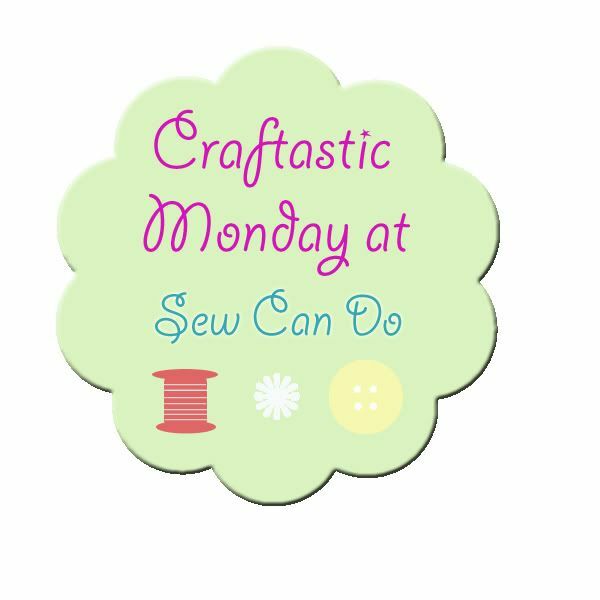 I need to make a ton of stuff for next week and haven't even started! Eek! Well, to get into the spirit of things, I thought I would share with you my mantle decor today. I usually have my lanterns up that were props from our wedding, and I just change something about them to tie in with the current theme. 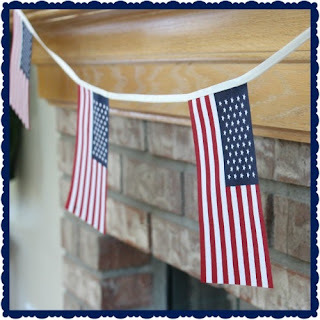 This holiday, I tied flag ribbon to the tops of them. 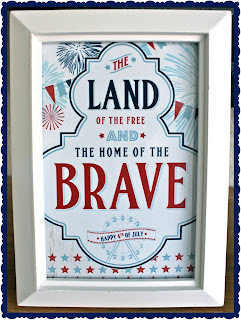 Then, I framed this adorable printable from Hostess with the Mostess. 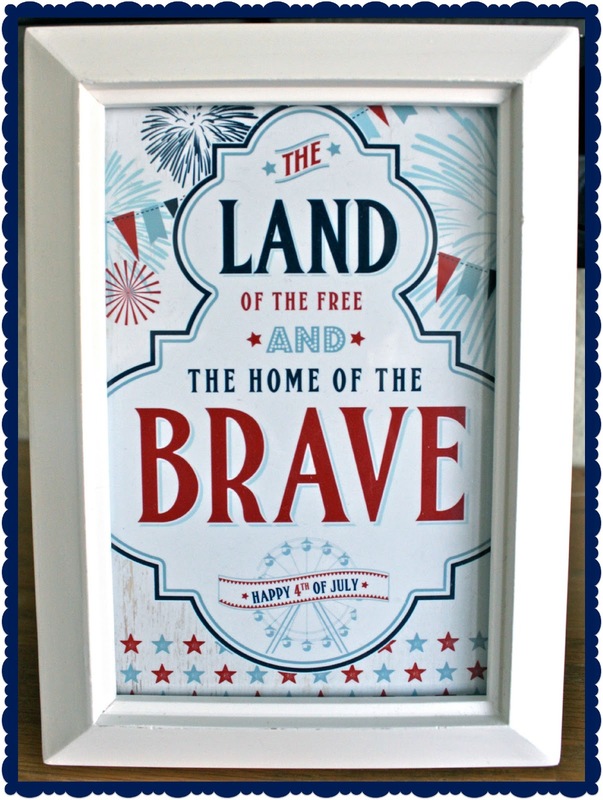 We are also using her printables for our 4th BBQ, which I can't wait to share with you! 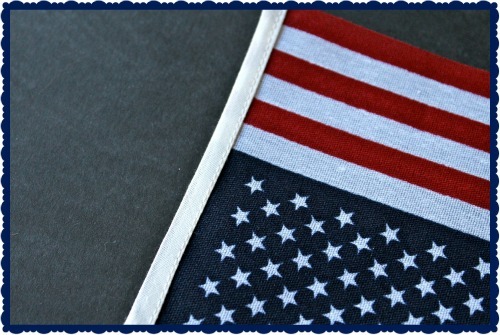 Finally, I made this flag banner and it was so easy! 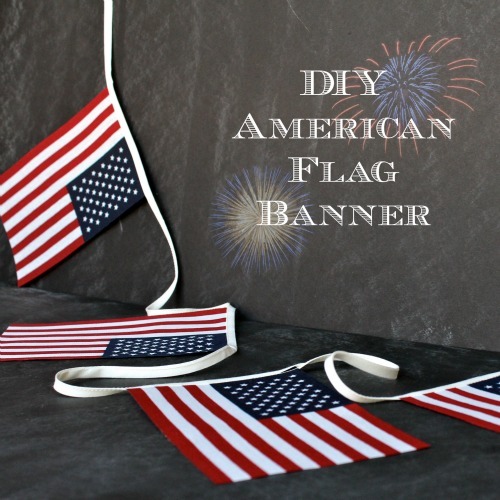 In a few minutes you can have a custom flag banner for your 4th festivities. 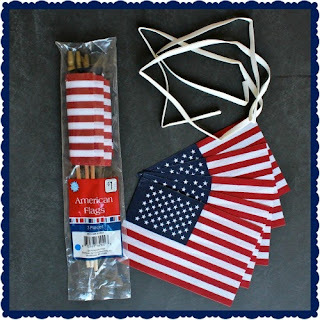 Remove as many flags as you want to use from their sticks. I pulled mine off pretty easily. 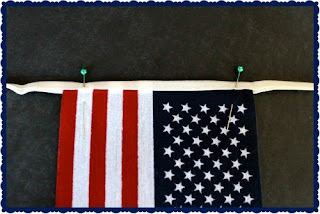 If you are using bias tape, space out your flags evenly, sandwich them between the tape, and pin. 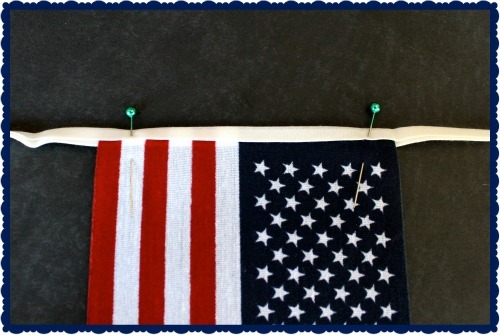 If you are using ribbon, space the flags out evenly and pin. Sew down the bias tape or ribbon as close to the edge as possible. Done! So simple and you have a cute and non-cheapy looking (albeit cheap) banner! Hope this American Flag Banner Tutorial comes in handy for your 4th of July Fun! Hi Alyssa! 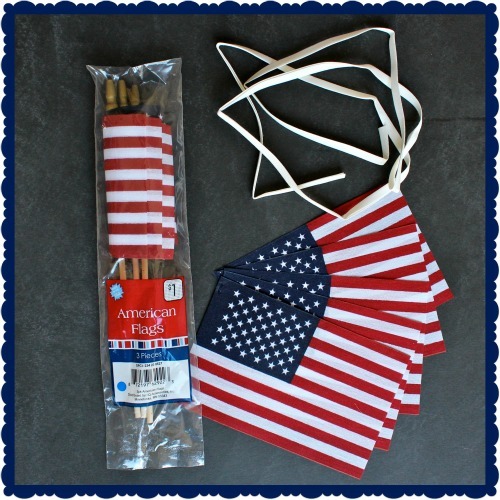 Love your flag banner and how perfect to celebrate the 4th! Thank you so much for sharing and joining us at Best of the Weekend! Hope YOUR weekend is wonderful! Very cute project! I never seem to get my house decorated for various holidays but this doesn't look too difficult! Thank you! It was so easy to make and only took me a few minutes! Thanks Heather! It was super easy! Great project but do you realize that your flags are hanging backwards? The field of stars must always be in the upper left corner no matter whether it is hung horizontally or vertically. So cute! I love it - thanks so much for linking it up to Super Sunday at Who Needs a Cape! Hope you can come back next week! This is a great idea! I pinned for next year! My name is Alyssa and I am a wife, momma, crafter, and (sometimes) baker/cook. I love all things creative and especially love to share them with you! Thanks for stopping by!